Martial arts movie history was made in 1973 when Robert Clouse's Enter The Dragon, the first martial arts film produced in America, made Bruce Lee a household named throughout the world and at least partially started the martial arts craze of the seventies. 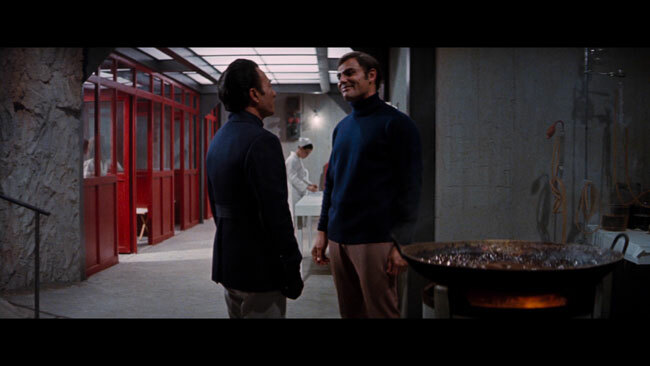 Granted, Lee’s star had been on the rise in worldwide since his work on The Green Hornet first brought him to attention outside of his homeland, but this film really took things to the next level. 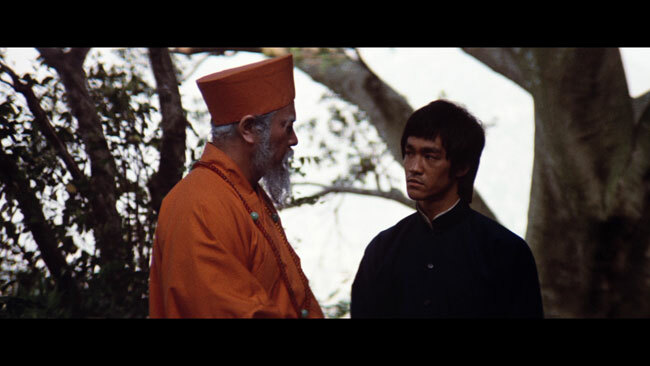 Bruce Lee plays Lee, a member of the Shaolin Temple and master of the martial arts who is to attend a tournament being held by a mysterious man named Han (Kien Shih) who lives on a remote island. Han is a former Shaolin Monk who left the temple and went out on his own. 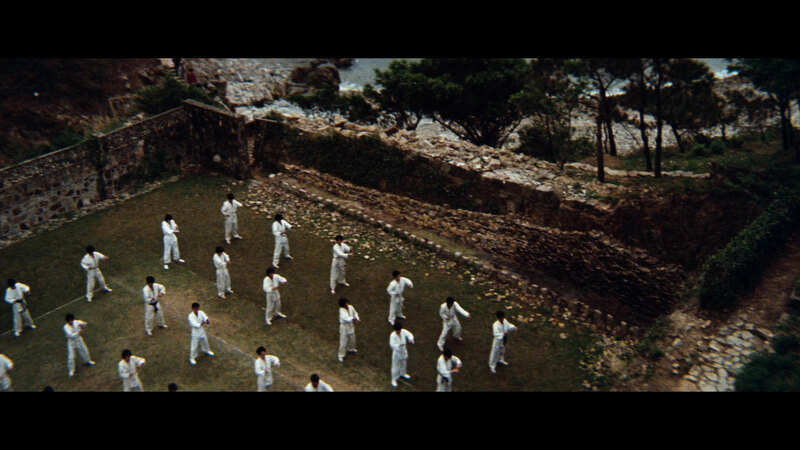 He now has a massive army of martial artists at his disposal who live on the island with him. He’s also got a veritable gaggle of hot women hanging around to take care of his every need, and he’s happy to share them with the guests he’ll soon play host to. Han is also supposedly involved in an illegal opium trade and also appears to be dabbling in white slavery – this explains all the hot chicks running around the island. 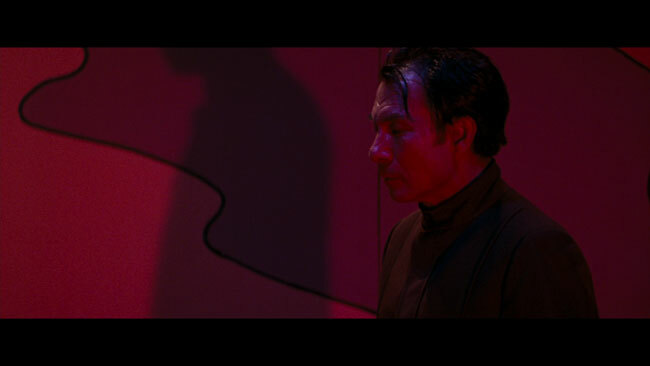 Unbeknownst to Han, Lee is sent there under the guise of competing in Han’s tournament so that he can and try to get some substantial evidence against Han, the kind that would be needed to bring him to justice. When Lee finds out that Han is responsible for the attempted abduction of his sister (Angela Mao) from three years ago and her resulting suicide, that clinches the deal for him and he's off. 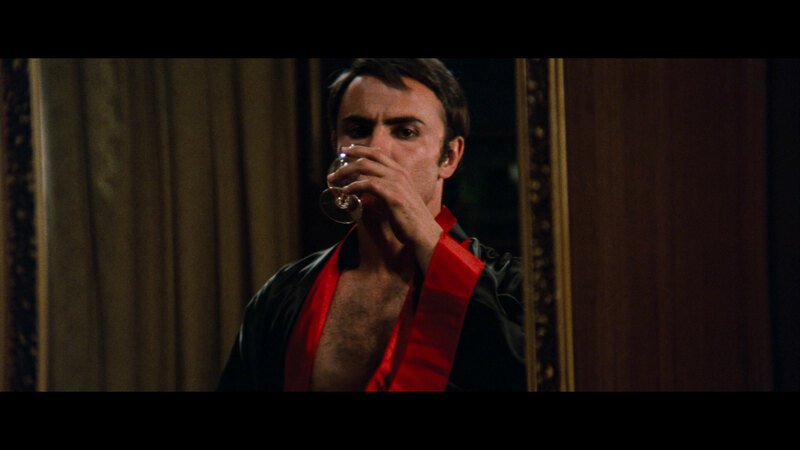 Along the way, Lee teams up with a man named Roper (b-movie favorite John Saxon of Black Christmas and Cannibal Apocalypse) who has a financial problem with a few gangsters. These guys intend to get their money from him by whatever means necessary. Roper has hopes of winning the tournament to get the prize money and take care of his problem. 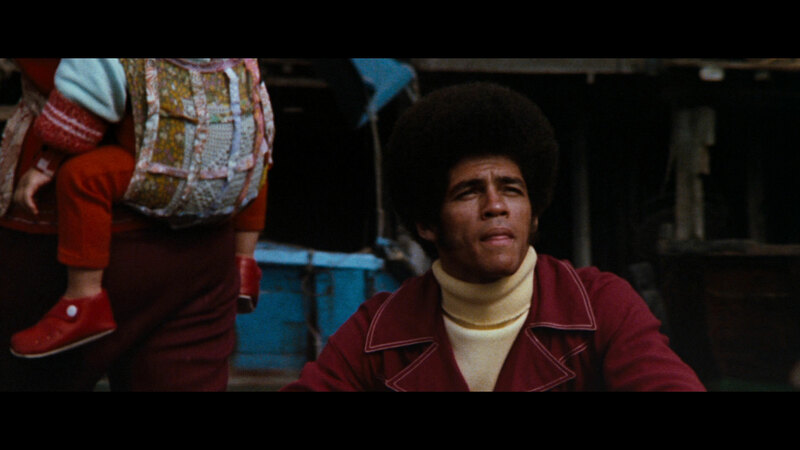 A third man, Williams (played with maximum cool by the Black Samurai himself, Jim Kelly), is also on the scene with hopes of taking home the prize and scoring with a bunch of Han’s women. Williams is a player. Han, however, is more prepared than anyone realizes, and when Lee starts snooping around the island, things start to hit the fan. From the beginning scene with Lee practicing his moves to the infamous grand finale in Han's house of mirrors, Enter The Dragon is an ultra-slick blending of the kind of stylish action movies that the American film industry was pumping out in the seventies, albeit one with a very Asian sensibility to it. 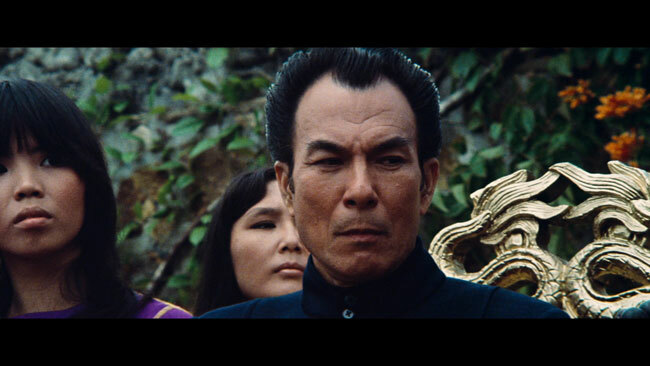 Given that this was a co-production between Warner Brothers and Golden Harvest, this makes sense and we wind up with the best of both worlds: the slick, no-nonsense action scenes of Lee’s earlier kung-fu movies with the production values of a major Hollywood studio backed project. The fight scenes are tighter than a knot and performed with both grace and brutality. 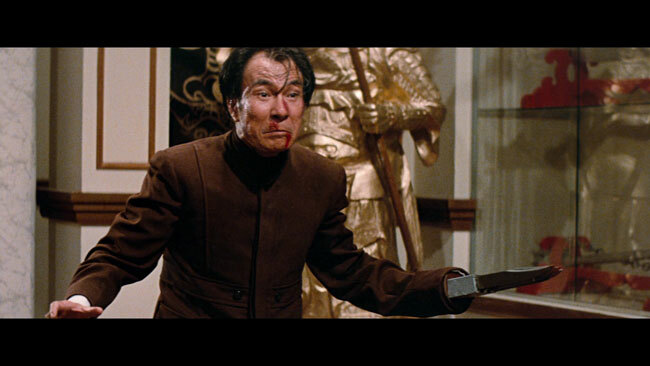 They also play out on a fairly grand scale, as we not only get a few solid one on one scenes but also some massive group brawls and of course, the scene in Han’s dungeon where Lee not only takes on a snake but also beats the living snot out of over fifty of Han’s minions. 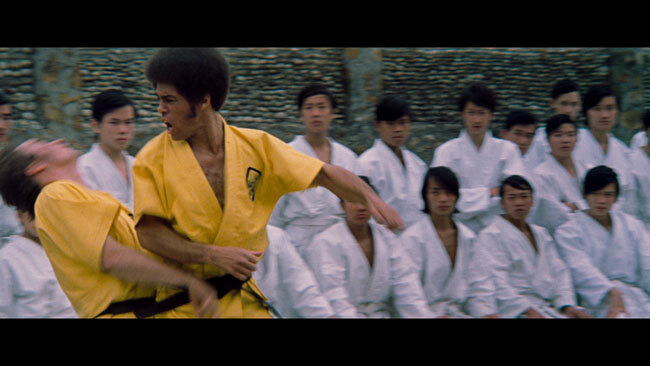 Here Bruce Lee plays the consummate hero, a man with the noblest of intentions and the skills to get the job done. He’s there to work, to get in and get out with what he needs and to see that Han is brought to justice for what he’s done not only to Lee’s sister but to the world at large. 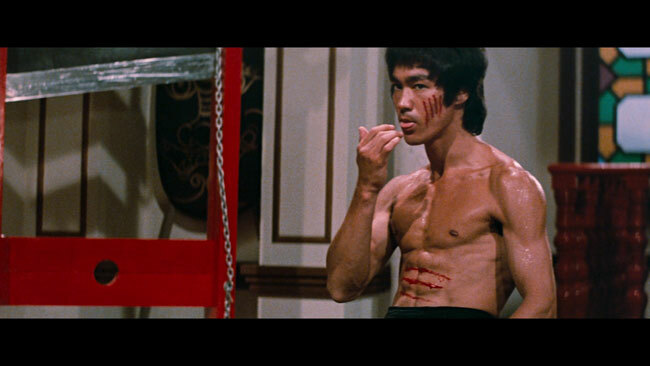 Bruce Lee fits the role perfectly, he’s as cocky and insanely confident as he needs to be but moves faster than seems humanly possible – his fight chorography skills beyond reproach. One the flip side of this, we get Roper and Williams who provide some interesting contrasts with 'human' characters who are prone to making some mistakes of their own along the way. Roper’s obviously in this for the money and Saxon plays this part well, while Kelly as Williams, a man with a keen eye for ladies of all kinds, steals pretty much every scene that he’s in. Kien Shih is completely diabolical as Han, he’s sinister and cool and completely evil and it’s hard to imagine anyone else in the role. With two blink and you'll miss it cameos from a young Jackie Chan, and a slightly more substantial cameo from a young but completely recognizable Sammo Hung, it's interesting to see this, Lee's most famous film, as a starting ground in a sense for those who would take up his mantle in the martial arts film world. 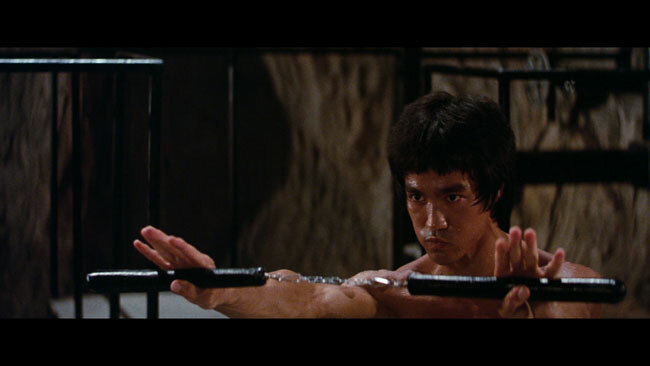 There are a few goof ups (you can see Lee working his mojo choreographing one of the final fights if you look carefully, and there's a cobra that rattles like a rattlesnake) but for the most part, Enter The Dragon is an extremely well made, polished, slick, and highly entertaining film that wears its age proudly on its sleeve, simultaneously a distinctly seventies film and a timeless action movie classic. It's a high point in the genre that has rarely been outdone and that most fight films, even now, more than thirty years later, simply cannot hold a candle to. 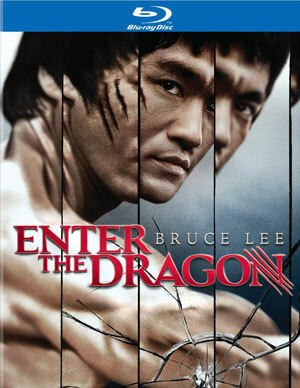 Enter The Dragon was released on Blu-ray by Warner Brothers a few years back and it looked pretty good, but this new transfer? It looks a lot better. Though it would be crazy to expect this one to look like a fancy new action movie might, detail and color reproduction are much improved. The film still looks like film, meaning that the grain structure is completely intact and not blasted with noise reduction, and while some of the lighting inherent in the original elements occasionally tweaks colors here and there, well, that’s just how Enter The Dragon has always looked. There’s no serious print damage, the image is clean and sharp and detailed without any evidence of over sharpening or contrast boosting, and the picture quality, overall, is excellent. Most fans would likely far prefer Warner Brothers leave this one looking like the early seventies production that it is and not hit it with filtering, and thankfully that’s what they’ve done, but the remastering has brought out more color, more detail and more texture than ever before. There are a lot of audio options here: There’s an English DTS-HD Master Audio 5.1 track, Dolby Digital Mono tracks in French, German, Italian, Japanese and Spanish, Dolby Digital 2.0 tracks in Japanese, Spanish and Polish and a Dolby Digital 5.1 Surround Sound track available in Russian. That doesn’t cover you? Well, thankfully there are subtitles provided in English SDH, French, Spanish, Portuguese, Japanese, German, Italian, Greek, Korean, Polish, Romanian, Russian, Serbian and last but not least, Turkish. Once again, Warner Brothers have done a very respectful job here, giving the movie its lossless debut with the DTS-HD 5.1 mix without screwing around with the movie’s original sound design. While rear channels do spread things around a bit but do so without making anything sound forced. You’ll notice this more often than not when it comes to the score, which sounds considerably fuller and natural here than it has in the past. The sound effects still sound like sound effects and the dialogue still sounds like it was all done ADR style (because it was) but all in all we wind up with a mix that is clean, that demonstrates good use of directionality and that is properly balanced without any hiss or distortion to note. A lot of the extras on the disc will be familiar to fans, as they’ve appeared on the special edition DVD and then the first Blu-ray release. First up is the audio commentary that includes contributions from producer Paul Heller and screenwriter Michael Allin (who contributes by phone). 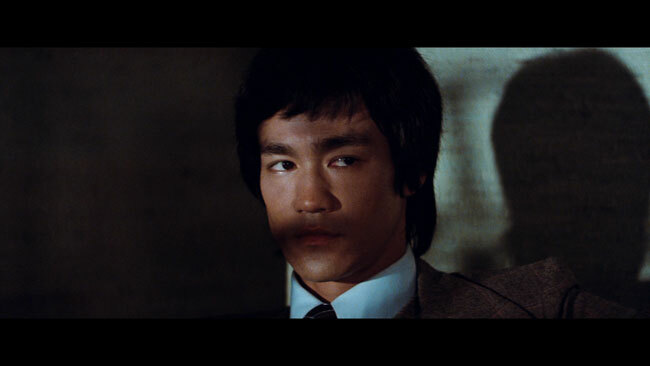 The pair do a nice job here of talking about how this project came to be, Bruce Lee’s involvement, how Golden Harvest came on board, and more. The focus is on the history of the film and how it was all put together more than anything else but if you haven’t heard this track before, it’s quite good. A few more minor carry overs from the previous disc include the eight minute 1973 Archive Featurette, the two minutes of Backyard Workout With Bruce footage, a collection of trailers and a few TV spots. But wait, there’s more! This is the 40th Anniversary Edition, right? There’s got to be a few new extras included, and there are. No Way As Way is a twenty-six minute documentary that includes archival interviews with Lee which are interspersed with newly show interviews with those he influenced: Sugar Ray Leonard, George Takei, Steve Aoki and Wren Lee Keasler as well as his widow and daughter, Shannon Lee and Linda Lee. This winds up painting and interesting portrait of Lee’s philosophy that mixes with his influence and it covers not only Lee’s attempts to bring marital arts to the masses but his film and TV work as well. Also new to this release is the twenty minute Wing Chun featurette, which is a collection of clips of loads of martial artists from all over the world who show off and explain the techniques that they’ve inherited from Lee’s teachings. Last but not least, we get a ten minute segment called Return To Han's Island. As you could probably guess, the focus here is on the locations used in the movie as we head to Hong Kong and the surrounding area to see where the movie was shot and learn about the history of those interesting places. Menus and chapter selection are also included on the disc. The disc itself fits inside a regular Blu-ray case that fits into the metallic embossed slipcase packaging alongside a couple of other bits and pieces – a collection of photographs and production art on some post cards, an iron on patch, a promotional flyer for an upcoming book of photography shot on the set of the movie, and a lenticular card that, if you wiggle just right, shows Bruce doing his thing with his nunchaku! Warner Brothers has really rolled out the red carpet for this one. 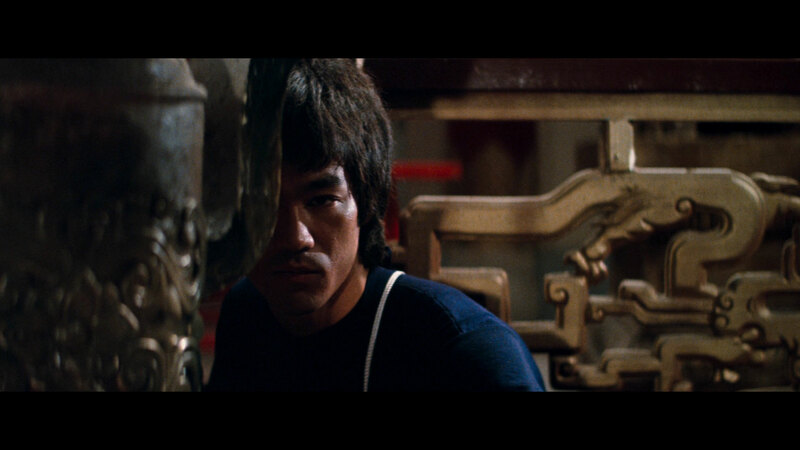 Enter The Dragon has never looked or sounded better than it does on this release and the new supplements help to round out an already extensive collection of supplements. A top notch release in every way you’d want it to be and a shining moment in the history of action films and the legacy of Bruce Lee. Wanted to confirm from somebody I knew, this is missing the doc from the old blu, "A Warrior's Journey", correct? I didn't even realize this already came out! 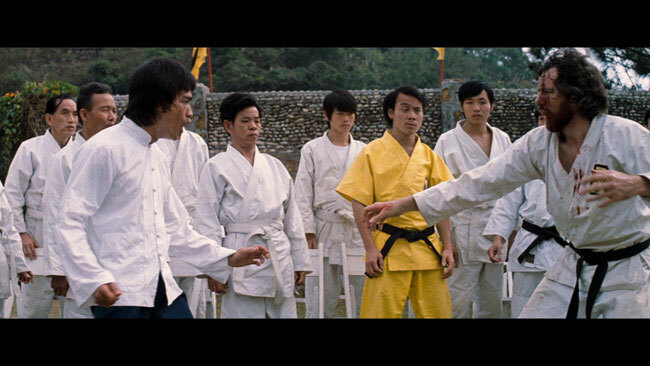 One correction is that the Jackie Chan cameo is towards the end when Lee snaps his neck. The guy who gets kicked in the groin looks a lot like Wilson Tong but I may be wrong. "A Warrior's Journey" is NOT on this set. It's only on the first pressing of the Blu from 2007. It actually got dumped when the 2007 Blu was repressed.